Welcome to my review of Kevin Fahey’s IM Newbie, Kevin Fahey is a successful internet marketer who has released many other popular marketing products. I found out about Kevin Fahey when someone mentioned his FaceBook advertising course as one of the best around. I did a bit of research and subscribed to his list,judging from the content from his emails, in my opinion, he is definitely one of the more ethical internet marketers. He does not bombard your inbox with offer after offer but does offer a lot of value and sometimes offers a lot of his courses are huge discount prices. Having said that, there is one part of IM Newbie that I did not like, and it’s not the product but the sales page. It suggests that following by the training within IM Newbie anyone can go from zero to $1000 in 30 days or less. However, because Kevin Fahey is the creator of this product and because it is inexpensive (I actually got it at half price), I purchased the product hoping to learn something new from a great internet marketer. So, without any further delay, let’s get on with this review of Kevin Fahey’s IM Newbie. Upsells have become a major part of internet marketing products and IM Newbie is no different. After purchasing the IM Newbie course, you are offered three upsells. I didn’t purchase any of them as I wanted to see if the main product lived up to its sales page claims. I was interested in purchasing the FaceBook masters course as I have heard a lot of positive stuff about it. However, my hands are full with other projects at the moment and didn’t want to get distracted with another course. Once inside the member’s area, there is a dashboard that shows you all the other products that Kevin has created. IM Newbie is right at the top and you will be asked to enter your login details one more time. 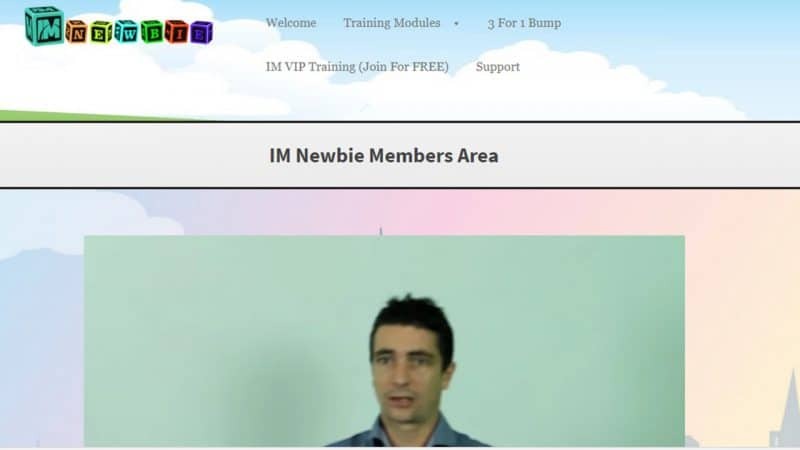 Once inside IM Newbie, there is a short video introduction from Kevin with an offer to join his monthly membership programme, IM VIP training. There is also a webinar that you can watch, which also leads to a pitch to join IM VIP training. The training consists of 6 modules containing 36 videos, the videos range in length, from 2 minutes to 30 minutes. The majority of the videos are short and easy to follow, there are some that are longer but still nothing too difficult for internet marketing newbies. If you have never set up a website and do not know how to navigate a cPanel, these modules will come in handy. Module 1 has 7 videos and covers registering a domain, hosting, uploading files through FTP and setting up email accounts for your site. Module 2 contains 6 videos and is all about WordPress, I have written about the popularity of WordPress and why it is the most popular CMS. WordPress makes building a website really easy and this video series takes you through the basics of installing and configuring a WordPress site. Personally, these two modules were not much use to me but if you have never built a website before, this will be essential viewing. This module introduces you to squeeze pages and autoresponders, it has 7 videos and the main objective is to show you how to build your email list. You will be shown how to create high converting squeeze pages with Optimize Press and build your list with Aweber. Even if you have a different landing page creator and autoresponder, the training will still be beneficial. There are videos on free and paid split testing methods and marketing automation. This module i really helpful and I am glad the training introduced me to Optimize Press, it’s a great landing page creator and it can do all the things page builders like Clickfunnels and LeadPages can do but doesn’t come with a monthly subscription plan. This module is all about the importance of having a social media presence and what it can do for your business. There are 6 videos in total, a few of them show you how to set up various social media accounts and how to create a Facebook fanpage. Very basic stuff and I didn’t learn a whole lot but if you are a complete newbie and have no social media presence, these videos will come in handy. The last video in this series was pretty helpful as it shows you how to integrate social media accounts on your landing pages and websites. If you have an Aweber account, you will also learn how to send email broadcasts to your twitter account. This was something new to me which didn’t know you could do. This is the most value packed module in the entire course. I found it helpful and the videos alone are worth the price I paid for the training. There are 5 videos in this module and it is all about blogging and how to monetise your web content. Now the videos about creating blog posts and how to monetise your website were nothing new, however, the videos about driving traffic through Facebook were insightful. There are two videos regarding driving traffic through Facebook, one teaches a free method and the other is through Facebook ads. Both these videos are worth watching as they cover a lot important aspects of Facebook advertising and how to run a successful ad campaign. There is also one video about picking affiliate offers from your niche, Kevin shows you three platforms that you can use to promote products or services as an affiliate. The three platforms are JVZOO,Warriorplus and Muncheye. JVZOO and Warriorplus are similar sites in which people can sell or promote digital products. Muncheye is where you can see which products are being launched, which platform they are being launched on and visit their JV site for more info on the products/services that is being offered. You can apply the training for any affiliate network that you may want to promote and not just the three that are mentioned. This module only has 1 video and for some reason, I couldn’t access it, since its titled ‘conclusion video’ I wasn’t really bothered that it was inaccessible. You are given a free ebook called ‘Dropout Entrepreneur’ it documents Kevin’s Journey to becoming a successful internet entrepreneur. You are also given access to Kevin’s private Facebook group, this is one of the better internet marketing groups I have joined and I would encourage anyone to join this group. In the final section of module 6, there is a bunch of PLR products that you are given for free. The best way to make use of PLR products is to give them away to build an email list, you can try and sell them, personally, I wouldn’t because the material is too generic and it can be found online for free. Kevin Fahey’s IM Newbie is a decent product, if you are a complete newbie to internet marketing, this is a product you should consider purchasing. There are modules that I didn’t find much use for, but then again, I am not a complete newbie to this, the modules I found most helpful to me were 3 and 4. I enjoyed the tutorials on Facebook marketing and how to drive traffic with Facebook ads. The only negative I have about this product is its sales page, I don’t like it when marketers claim their products can make you a certain amount within a certain time frame. This is especially true for newbies as mistakes will be made and there will be a lot of trial and error before you find a profitable advertising campaign for whatever affiliate products you want to promote. So, aside from the sales page and its income claim, this is a product I do recommend. Not only is the training easy to follow you will also receive a lot of high-value emails from the vendor. However, although I do endorse this course, I believe there is a better option out there and that is Wealthy Affiliate. They have been helping online entrepreneurs for over 10 years and are constantly improving their services, read my full and honest review of Wealthy Affiliate. Six Figure Mentors Review- Is it a Scam? I had never heard of this website or Kevin Fahey before. I do understand about finding some parts of the courses irrelevant if you already have that particular knowledge. It is probably a good idea to update and refresh the knowledge though. I guess things change, especially on the net, so building a successful business means keeping up with the changes in Google, Facebook etc. Do you think Mr Fahey succeeds there? Does he keep his videos updated to include current changes? I like the fact he does not charge memberships. That is always a killer for me. Wealthy Affiliate looks interesting. there is an annual membership if you opt for the “pro” training. Do they really have a free introductory membership? I mean, is it really free? and how long for? Can you really learn something usable in the free section? Kevin Fahey does update is products and he is easy to get in contact with. He does have a membership course but this isn’t one of them. All his courses have been well received. In my opinion he is one of the few ethical marketers who you can trust. Wealthy Affiliate does indeed have a free membership which you have for life, the first 7 days you are allowed access to some premium membership features after that, you will have limited access to the membership site. You still get 2 free websites hosted on their powerful SiteRubix platform. As for the paid membership, there are two plans, monthly and annually, on the annual plan you save yp to 39% of the monthly cost. Hi Minhaj, thank you for your insightful review, it helped me to decide about IMnewbie, from what I understood from this post it is a legit program and there is something new to learn, I will pay 10 bucks to learn something new even if it is just one concept. Thank you.